Virkon S is a powerful, broad-spectrum disinfectant, that is effective against more than 500 strains of bacteria, viruses & fungi, including Equine Herpes Virus 1, Equine Influenza Virus (Type A), Foot & Mouth, Salmonella, Campylobacter & Avian Influenza. This breakthrough formulation is so effective, it is approved by Governments worldwide for Emergency Disease Control and has been used to combat major diseases such as Foot & Mouth disease, Avian Influenza and Newcastle disease. It is successful even in low temperatures or with lots of organic matter present and kills pathogens ten times faster than other competitors, making it the "gold standard" foot dip disinfectant for vets, farmers, laboratories and horse owners. It is also safe and convenient to use, transport and store and can be misted in the presence of animals. One 5g Virkon tablet makes 500mls of disinfectant solution. Tablets come in packs of 50. One 50g Virkon tablet makes 5 litres of disinfectant solution. Tablets come in packs of 50. 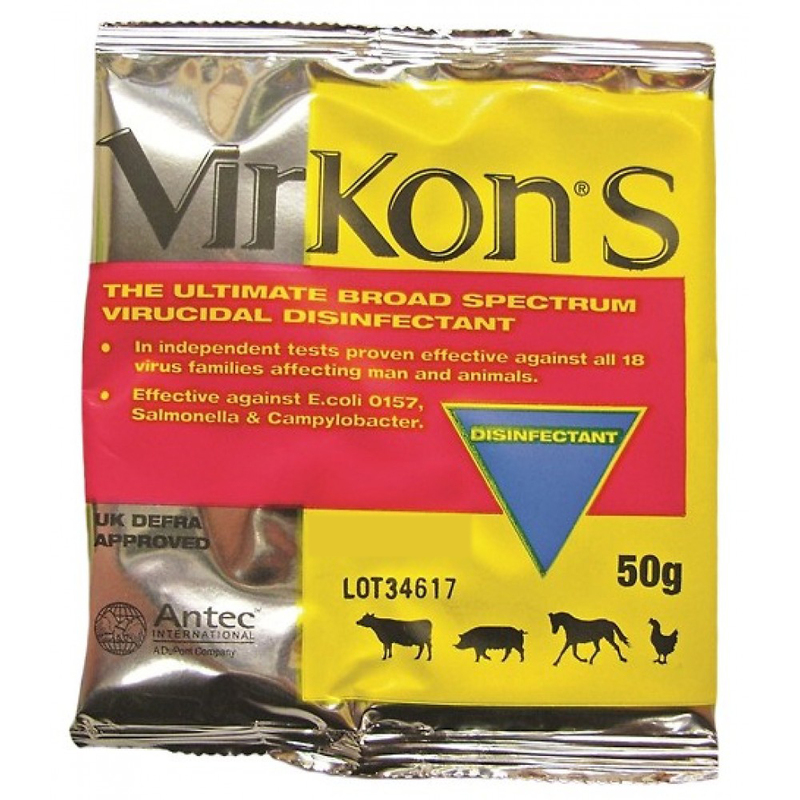 One 50g Virkon sachet makes 5 litres of disinfectant solution. Sachets come in packs of 5 or 50. Virkon™ S has also been formulated to include ingredients that have been carefully selected for their ability to degrade naturally within the environment.